With the many plastic materials available today, selecting the best one can be an intimidating proposition. Here are guidelines to assist those less familiar with these plastics. Determining the primary function of the finished component will direct you to a group of materials. For example, crystalline materials (i.e., nylon, acetal) outperform amorphous materials (i.e., polysulfone,Duratron® PEI or polycarbonate) in bearing and wear applications. Within the material groups, you can further reduce your choices by knowing what additives are best suited to your application. Wear properties are enhanced by MoS2, graphite, carbon fiber and polymeric lubricants (i.e., PTFE, waxes). Structural properties are enhanced by glass fiber and carbon fiber. Once you have determined the nature of the application (B&W or Structural), you can further reduce your material choices by determining the application's mechanical property requirements. 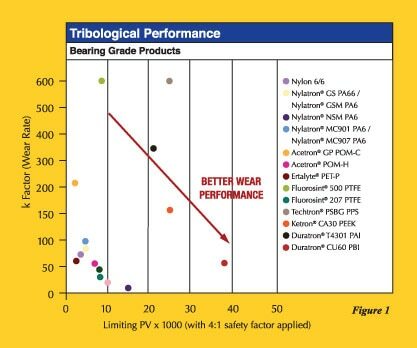 For bearing and wear applications, the first consideration is wear performance expressed in PV and"k" -factor. Calculate the PV (pressure (psi) x velocity (fpm)) required. Using Figure 1, select materials whose limiting PV's are above the PV you have calculated for the application. Further selection can be made by noting the "k" wear factor of your material choices. In general the lower the "k" factor, the longer the wear life of the material. 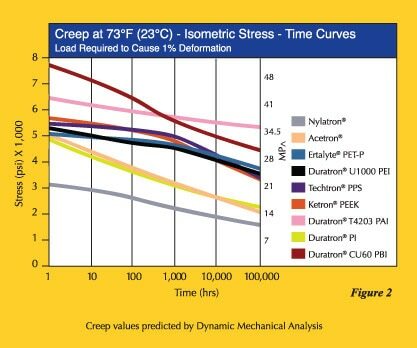 Structural components are commonly designed for maximum continuous operating stresses equal to 25% of their ultimate strength at a specific temperature. This guideline is meant to compensate for the viscoelastic behavior of plastics that result in creep. 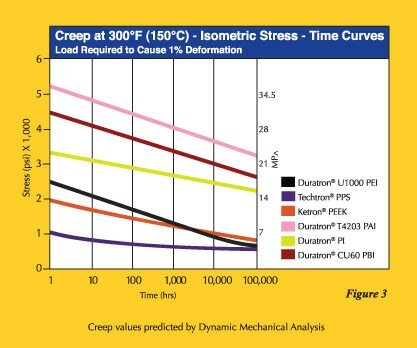 Isometric stress-time curves are provided here to help you characterize a material's strength behavior as a function of time at both room temperature (Figure 2) and at 300°F (Figure 3). Consider the thermal requirements of your application using both typical and extreme conditions. A material's heat resistance is characterized by both its heat deflection temperature (HDT) and continuous service temperature. HDT is an indication of a material's softening temperature and is generally accepted as a maximum temperature limit for moderately to highly stressed, unconstrained components. Continuous service temperature is generally reported as the temperature above which significant, permanent physical property degradation occurs after long term exposure. This guideline is not to be confused with continuous operation or use temperatures reported by regulatory agencies such as Underwriters Laboratories UL. The melting point of crystalline materials and glass transition temperature of amorphous materials are the short-term temperature extremes to which form stability is maintained. For most engineering plastic materials, using them at or above these temperatures should be avoided. Consider chemicals to which the material will be exposed during use and cleaning. Mitsubishi Chemical Advanced Materials provides chemical compatibility information as a guideline in this brochure although it can be difficult to predict since concentration, temperature, time and stress each have a role in defining suitability for use. Nylon, acetal and Ertalyte® PET-P are generally suitable for industrial environments. 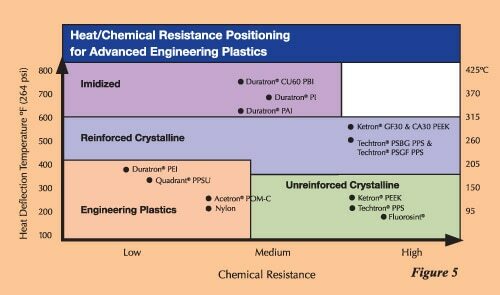 Crystalline high performance materials such as Fluorosint® filled PTFE, Techtron® PPS and Ketron™ PEEK are more suitable for aggressive chemical environments (See Figure 5). We strongly recommend that you test under end-use conditions. Specific chemical resistance can be found on the property comparison chart. Materials with higher tensile elongation, Izod impact and tensile impact strengths are generally tougher and less notch sensitive for shock loading applications (See Table 1). Engineering plastics can expand and contract with temperature changes 10 to 15 times more than many metals including steel. The coefficient of linear thermal expansion (CLTE) is used to estimate the expansion rate for engineering plastic materials. CLTE is reported both as a function of temperature and as an average value. Figure 6 shows how many different engineering plastics react to increased temperature. Modulus of elasticity and water absorption also contribute to the dimensional stability of a material. Be sure to consider the effects of humidity and steam. Agencies such as the Food and Drug Administration (FDA), U.S. Department of Agriculture (USDA), Underwriters Laboratory (UL), 3A-Diary Association and American Bureau of Shipping (ABS) commonly approve or set specific guidelines for material usage within their industrial segments. Select the most cost-effective shape for your part. Mitsubishi Chemical Advanced Materials offers designers the broadest size and configuration availability. Be sure to investigate all of the shape possibilities — you can reduce your fabrication costs by obtaining the most economical shape. Consider Mitsubishi Chemical Advanced Materials' many processing alternatives. Note: From process to process, many material choices remain the same. However, there are physical property differences based upon the processing technique used to make the shape. Injection molded parts exhibit the greatest anisotropy (properties are directionally dependent). Extruded products exhibit slightly anisotropic behavior. Compression molded products are isotropic — they exhibit equal properties in all directions. Determine the machinability of your material options. Machinability can also be a material selection criterion. All products of Mitsubishi Chemical Advanced Materials in this site are stress relieved to enhance machinability. In general, glass and carbon reinforced grades are considerably more abrasive on tooling and are more notch sensitive during machining than unfilled grades. Reinforced grades are commonly more stable during machining. Because of their extreme hardness, imidized materials (i.e., Duratron® PAI, Duratron® PI and Duratron® PBI) can be challenging to fabricate. Carbide and polycrystalline diamond tools should be used during machining of these materials. To aid you in assessing machinability, a relative rating for each material can be found on the property comparison charts. Make sure you receive what you specify. The properties listed in this site are for products of Mitsubishi Chemical Advanced Materials only. Be sure you are not purchasing an inferior product. Request product certifications when you order. All material have inherent limitations that must be considered when designing parts. To make limitations clear, each material profiled in this site has an Engineering Notes section dedicated to identifying these attributes. We hope our candor about material strengths and weaknesses simplifies your selection process. For additional information, please contact Mitsubishi Chemical Advanced Materials' Technical Services Department.